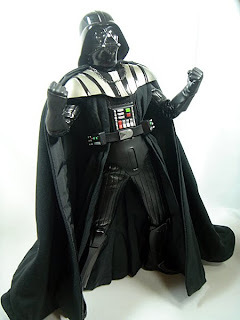 Batcave Toy Room - Better Living Through Toy Collecting: Was Darth Vader Crazy? From CNN.com: What is Darth Vader's diagnosis? French researchers posit that Vader exhibits six out of nine criteria for borderline personality disorder. Unstable moods, interpersonal relationships, and behaviors are all characteristics of this condition, according to the National Institutes of Mental Health. It affects 2 percent of adults, mostly young women. His "infantile illusions of omnipotence" and "dysfunctional experiences of self and others" are also indicative of his condition at a early age. It's funny how fictional characters like Darth Vader or Batman get analyzed by psychologists like they are really people. Oh, wait. They are real people. For more Star Wars news check us out.